Whether for home or business use, an oil storage tank can help cut down on energy costs – but what do you need to know in order to store oil safely and securely? In England and Wales, there are guidelines in place with regards to safe oil storage. Firstly, you can rest assured that all of Tuffa Tanks’ manufactured products comply with all legal requirements, which is one less thing to worry about when choosing the right oil storage tank for your needs. While all of our tanks meet the required standard for use in England and Wales, there are also safety guidelines on where to keep and how to fill up your tank. These are not only in place to protect those using storage tanks but also anyone that may pass by the tank’s vicinity. To comply with UK legislation, oil storage tanks must be installed in a safe location which minimises the risk of impact. For example, you should not keep your tank close to any driveways, walkways or anywhere that an exposed tank is likely to be in the way. If it is not possible to keep your tank in a location that is completely out of harm’s way, you should look to install a barrier around your tank. This will help to ensure that no one passing by suffers an accident as a result of your tank and also safeguards the tank from receiving any damage as a result. In the UK, there is also a legal requirement for fuel tanks to have some kind of secondary containment installed. 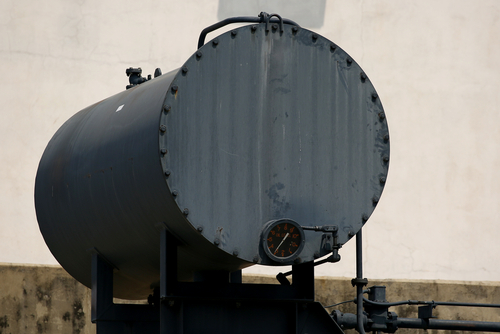 All fixed oil tanks must be bun­ded; this is to ensure that no harmful elements come into direct contact with anyone using the tank, or passing by. All secondary containers must have the capacity to fit 110% of the primary containers. As an example, all 3,000-litre tanks must be installed with a secondary container with a capacity of 3,300 litres in order to capture any overspill from re-filling. Carrying out regular inspections of your oil storage tank is a must. When doing so, you should be on the lookout for any sign of damage to both the interior and exterior of the tank such as deformation (bulging, changed colour or stress fractures), damp patches and corrosion. A responsible person should be on hand to carry out an inspection for every refill – if this is not possible, an inspection should be carried out as a matter of priority. For more information on the guidelines for keeping and using an oil storage tank, or what the benefits are for your home or business, please call the Tuffa Tanks team on 01889 567700 or fill out an enquiry form.